Voted Most Popular Attraction - Wildlife Park 2011 by the Asian Attractions Awards. Singapore Zoo is also one of the best zoos in the world. At Singapore Zoo you'll be given the unique opportunity to encounter, contemplate and communicate with over 300 species and 2,800 animals, wandering freely in their neary to natural habitats. In the limits of safety and respect to its residents, the Park with its open-concept approach and elaborate design, allows visitors to mingle around with a maximum of proximity to the animals. You will observe giraffes, zebras, rhinoceros and kangaroos in their paddocks, while orang utans, chimpanzees and lions are kept in open enclosures only surrounded by peaceful moats. For the animals more likely to escape such as leopards and jaguars, they are kept in landscaped glass-fronted enclosures. Some high spots of the zoo: Inuka at the Frozen Tundra, who is the only Singapore-born polar bear; the free-ranging orang utan areas and the Bornean orang utan island for which you won't miss the snapshot sessions at 11am, 3:30pm and 4:30pm. Covering 26 hectares in the lush greenery beside Upper Seletar Reservoir, Singapore Zoo is a vast haven for over 2,800 animals from 314 species of which 26% are threatened. With about 1.6 million visitors each year, Singapore Zoo is a major touristic draw for the country. Continuously making effort to exceed healthcare needs of its animals, Singapore Zoo and the Wildlife Healthcare and Research Centre work since 2006, toward the aspiration of becoming a leading global centre of excellence for veterinary healthcare and research. Dine with Singapore Zoo's charismatic orang utans at the world's only place to do so. This award-winning breakfast program where you're able to take a photo with the orang utan, watch the elephants bathe in the morning, have the opportunity to feed them, have a close-upview of a snake from afar and then enjoy the delectable buffet spread. And for your private or corporate gatherings, Singapore Zoo features 5 venues to host your venues. This must-see attraction is open 365 days a year for all tourists and locals to enjoy. Watch our video of Singapore Zoo and have a closer look! 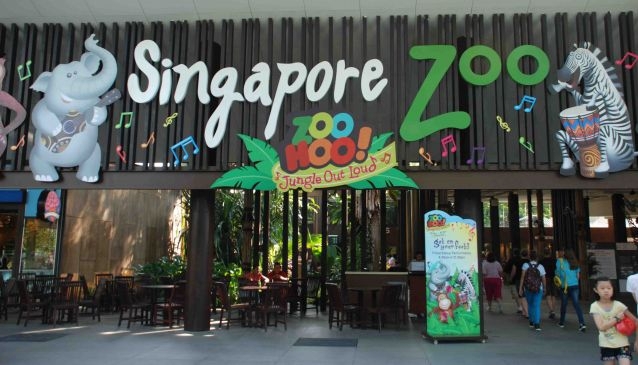 Park Hopper Package to visit Singapore Zoo, Night Safari and Bird Park. Adult: S$58, Child (3-12yrs old): S$ 38.